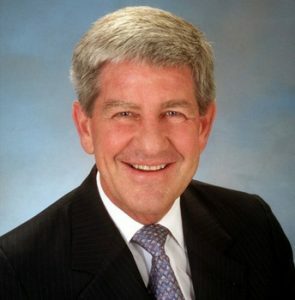 Geoffrey L. Stack is a Managing Director of Irvine based SARES-REGIS Group, one of the largest, most diversified commercial and residential real estate firms in the West. He is the partner directly responsible for all residential operations of the company including development, acquisitions, finance and management activities. The SARES-REGIS Group was formed in 1993 through the merger of two West Coast real estate leaders, Newport Beach based Regis Group and The SARES Company of Irvine (formerly known as The Sammis Company). The firm has a combined portfolio of real estate properties and fee-based management contracts valued in excess of $4 billion, including 16,400 rental apartments; 16 million square feet of commercial and industrial space; and has or had major asset management contracts with many of the nation's largest institutional investors, including AIG, BlackRock Realty, CalPers, Camden Capital, Capri Capital, Centerline Capital, Cornerstone Advisors, Equity Residential Properties Trust, INVESCO Realty Advisors, J.P. Morgan Fleming Investment Management, Northwestern Investment Management Company, RREEF, and UBS Brinson Realty Investors. Before the merger, Mr. Stack was President of Regis Homes and led the firm in becoming an established leader in the development, management and sale of multifamily rental and for-sale properties. Under his leadership, from 1977 to present, Regis converted over 8,700 apartments to condominiums with gross sales in excess of $900 million. Since the early 1980s, Regis has built over 19,000 apartments and condominiums. Currently, the SARES-REGIS portfolios of apartments owned and in planning have values totaling more than $2 billion. Mr. Stack is a graduate of Georgetown University and earned an MBA at the Wharton School. Prior to entering the field of real estate development, Mr. Stack worked as an aide to U.S. Senator Paul H. Douglas and served three years as an officer in the USMC attaining the rank of Captain. ​Mr. Stack sits on the Board of Directors of the Tejon Ranch Company (NYSE); Georgetown University Board of Regents; the Board of Directors of the California Housing Council; the Board of Directors of the National Multi Housing Council. He is a Trustee of the Urban Land Institute and is on the Policy Advisory Board of the Fisher Center for Real Estate and Urban Economics, University of California, Berkeley. He is the past Chairman of the Board of Directors of the National Multi Housing Council, past Chairman of the ULI Multifamily Silver Residential Council and past Director of the Marine Corps Scholarship Foundation. He is a founding Trustee of the Cystinosis Research Foundation.